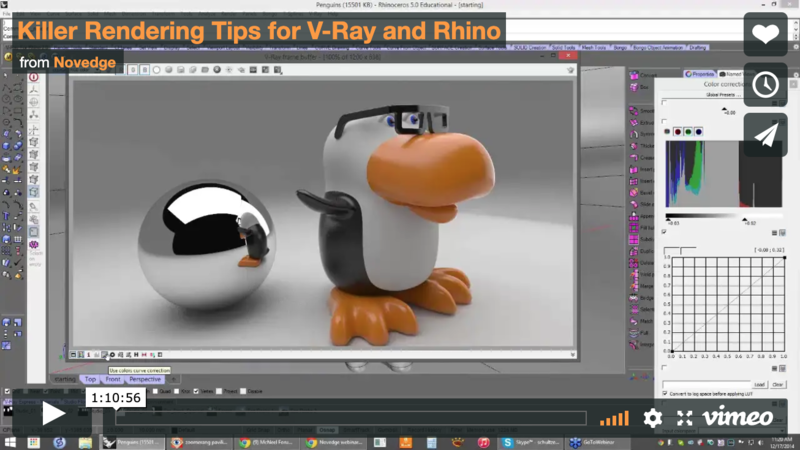 Dave Schultze is proud to announce that his video tutorial, ‘Killer Rendering Tips for V-Ray and Rhino‘ is now the #1 webinar of all-time for Novedge.com. Originally recorded in December 2014, the webinar has been viewed by more people than all of the other 203 webinars produced to date. Novedge is a leading online software store for design professionals. They have been helping designers get better with their digital tools since their first webinar was released in 2010. You can check out the full list of all 203 webinars at the Novedge Webinar directory. Dave Schultze is an award-winning industrial designer and founder of schultzeworks designstudio. He has been teaching 3D visualization at OTIS College of Art and Design since 2000 and has authored nine courses for lynda.com. Dave also offers Rhino and V-Ray training for corporate clients, groups, and individuals. To get in touch, visit the training page at Dave’s Professor3d website.